Marvel Owns Screen Rights For Ghost Rider, Blade, And The Punisher. Are New Movies In The Works? The Marvel Universe has gotten a little more Amazing with the announcement of some spectacular news. Ghost Rider, Blade, and the Punisher are now free to join Disney’s Marvel Universe now that the film rights have reverted to Marvel Studios. According to Kevin Feige of Marvel Studios, this is fantastic news, but according to i09, we might not see reboots any time soon. Although many would love to see the trio of characters hit the big screen once again, hopefully minus Nicholas Cage, knowing that they are no rushing in to a reboot of each is refreshing. As the Marvel story lines develop, it will be great to allow the characters to naturally find their spots, rather than forcing them into a already established storyline. Den of Geeks shared their take on the order they hope to see new Blade, Punisher, and Ghost Rider moves released in the new Marvel Universe. 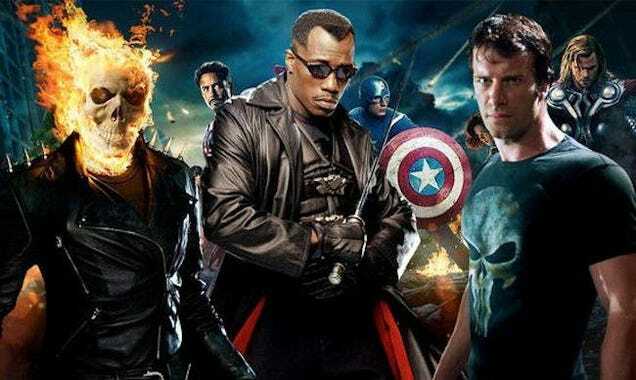 Although there is no mention of Ghost Rider in their prediction, it may be assumed that he would appear between the Punisher and Blade. It is great to see that Marvel has regained rights to some of their key franchises, but there are still others that fans are anticipating. The Fantastic Four is set to be rebooted, again, after minimal success with Fox. If the reboot does not happen, the rights will revert to Marvel. The same applies to Daredevil. The X-Men franchise is another set of films that fans would like to see merged with the existing Marvel Universe, however it is unknown if the actors would be contractually allowed to move to Marvel Studios to continue onward with the franchise. Some would like to see the X-Men rebooted with new characters, but Wolverine has already established himself in his current universe fairly comfortably. With so much hype lately about Spider-man spinoffs, could we see the trio of movies finally make their return in the expanded Marvel Universe?